This sky map shows the locations of Saturn, the moon and the bright star Spica as they will appear on Saturday, March 10, 2012 at 11 p.m. local time to skywatchers at mid-northern latitudes. 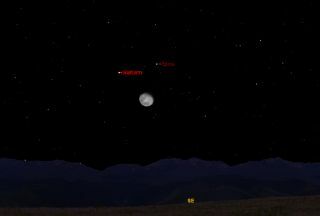 Skywatchers who are out during the late-evening hours on Saturday (March 10) will have an interesting celestial array to admire, composed of the moon, a bright planet and a bright star. Start looking low toward the east-southeast sky beginning soon after 9:30 p.m. local time. There you will find a waning gibbous moon, accompanied by the planet Saturn, which will be shining sedately with a yellowish-white glow well above and to the left of the moon. Hovering above and slightly to the right of the moon, meanwhile, will be the bright bluish star Spica, in the zodiacal constellation of Virgo. The moon, of course, appears to pass Spica every month, but recently Saturn has happened to be nearby too, and for the past year we’ve referred to this trio as the "Saturn Triangle." When it first appears above the east-southeast horizon, the triangle will be pointing down and to the right. This sky map of Saturn and the moon show how they form a triangle with the bright star Spica on Saturday. By around 1 a.m. local time on Sunday morning, the trio will have moved across the sky to a position about one-third up from the east-southeast horizon. But the triangle will also look a bit different. For one thing, it now will appear to be pointing straight down toward the horizon. Saturn is currently 828 million miles (1.33 billion kilometers) from Earth, so it will not change its position relative to the background stars during the course of a single night. But the moon is only 223,400 miles (359,800 km) away; as a result, it will slowly shift its position toward the east, relative to the stars. In fact, the moon appears to move east against the background stars at roughly its own apparent width (one-half degree) per hour. As a consequence, from 9:30 p.m. on Saturday through 1 a.m. on Sunday, the moon will appear to move noticeably farther from both Saturn and Spica. This will transform the Saturn triangle into an isosceles, which has at least two equal sides, since the moon will be located at an equal distance from both Spica and Saturn: 7.5 degrees. If you’re planning to stay up later than this, and you live in a part of North America that observes daylight savings time, don’t forget to push your clock ahead one hour. By 5 a.m. (DST), just as dawn is about to break, the triangle will have moved over to the southwest sky and will be oriented in such a way that it will point down and to the left. In fact, it will be pointing almost due south. At magnitude +0.3, Saturn is roughly twice as bright as Spica. If you have a telescope, check out Saturn’s rings. Up until Feb. 5, Earth was seeing Saturn display increasing widening rings, reaching a tilt of 15.1 degrees to our line of sight. Since then, however, because of our own movement around the sun, the rings are now appearing to close up a bit. Nonetheless, they are still tilted 14.7 degrees toward us, and are readily seen if you are using a telescope with a magnification of at least 30-power.